Cracker Jack Candy for a #SundaySupper Game Day | What Smells So Good? Well, okay, it's not quite baseball season yet, but that doesn't mean the weekend television offerings are devoid of sports. Where we are it's all about the hockey games (or massacres if you're a TML fan like my stepdad), but the star of the show this weekend is undoubtedly the Superbowl. Millions of fans, billions of dollars and an entire afternoon dedicated to a single sport - it's remarkable the things the human race does for fun, no? I'll admit I've never watched a Superbowl game... heck, I don't think I've ever watched a football or a professional hockey game all the way through in my entire life. I just can't get into the "sports mentality" that surrounds the events, but that said... it's hard to pass up the party they bring along! It might be a mostly US "thing" to tailgate (I have yet to see any tailgaters for any event in Toronto) or host Superbowl parties, but if they're anything like the nights my stepfamily kicks off their hockey pool drafts you need three things: good friends, good beer and a lot of good food! 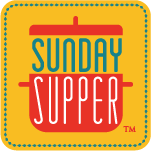 That's what this week's #SundaySupper is celebrating - all sorts of good game day eats and drinks. Since I don't know any group that can throw a party down quite as well as ours, it's sure to be a blast! Our host this week is Heather of Hezzi-D's Books and Cooks. Thanks Heather! 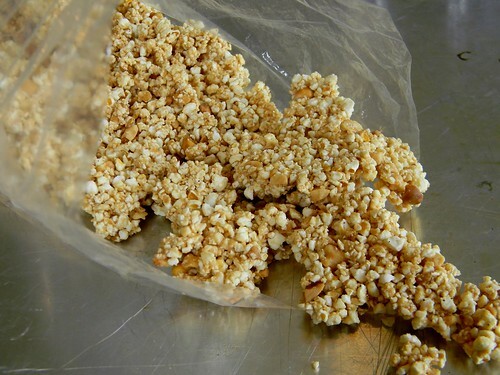 My offering is a little twist on the classic Cracker Jack candy... an easily veganized, sweet, salty and nutty combination that uses ground up popcorn instead of big ol' kernels and is baked into a wafer-like "break up" confection. It's almost like a peanut butter granola bar - but with chopped peanuts and coarsely ground popcorn in place of the oats! Now... I’m not telling you what to do with the (inevitable) crumbs, but this would make a delicious breakfast cereal (or ice cream topping!) in addition to out of hand nibbling. Let me know what you would do with your own bag of goodness! Preheat the oven to 200F and line a baking sheet with parchment. In a food processor, coarsely grind the popcorn until it is in little “balls”. In a large bowl in the microwave, combine the peanut butter, honey and sea salt. Microwave for 2 ½ minutes, stirring every 30 seconds. Immediately add the popcorn and peanuts, stir well and spread onto the baking sheet. Bake for 45 minutes. Store it in an airtight container.